The main topic of the presentation will be the description of the formation of Si versus Porous Silicon (PSi) contrasts, including processing, characterization and applications. Multiscale stripe micropatterns of Si and PSi have beenfabricated by means of a secuential high-energy ion-beam irradiation and electrochemical process. The surface properties of porous silicon areas evolve rapidly in phosphate-buffered saline. X-ray photoelectron spectra indicate the formation of a Si-OH and C-O enriched PSi surface, which becomes increasingly hydrophilic with aging time. 1D micropatterns have been used to analyze human mesenchymal stem cell (hMSC) adhesion. The actin cytoskeleton of hMSCs orients following the uniaxial micropatterns. In the wider Si stripes, hMSCs are dominantly located on Si areas. However, for reduced Si widths, adhesion is avoided on PSi by a split assembly of the actin cytoskeleton on two parallel Si areas. Further relevant observations stem from the formation of 2D micropatterns, which allow observing a MSCs anchoring following the squared lattice of the PSi/Si micropattern. 2001 PhD graduation in Physics in the Universidad Autónoma de Madrid (UAM, Spain). His thesis work was done in both Department of Applied Physics (UAM) and LMGP (Institut National Polytechnique de Grenoble, France). During this period (1997-2001), he specialized in thin film and interface processes for optical and biomedicalapplications. He further developed the micro and nano structure of such systems, includingorganic, inorganic and hybrid materials during a three year PostDoc (2002-2004) at the Institute for Health and Consumer Protection(Joint Research Center, Ispra, Italy). After a tenure track at theDepartment of Applied Physics (UAM) he became lecturer in 2010. 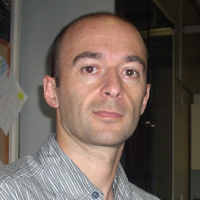 He is currently visiting scientist at Plasmore srl, (Italy).